Having a website rank high on the first page in organic search results has long been the viewed as the ultimate goal of SEO for businesses of all sizes. But for small businesses with limited geographic reach, earning a red dot on Google Maps is an equally worthwhile objective. Here are ten ways to rank higher on Google Maps. The first step is to set up and optimize your Google My Business Listing. The basic information includes physical address, phone number, and category. But you can also include photos to help engage viewers. Even more important, list your hours of operation and keep them up to date—especially during the holidays. You don’t want to get a bad review for posting inaccurate hours and having customers show up to find a “Closed” sign on your door. And, last but not least, be sure you enter your website URL for your Google listing. Having an awesome website will help drive a better map ranking. 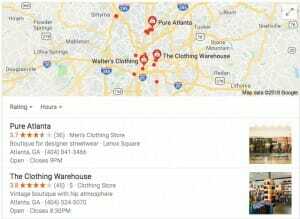 Google keeps its algorithms for Google Maps rankings close to the vest, but having plenty of reviews from real, happy customers will always help you move toward the top of the list. Commonly used platforms such as WordPress have Google five-star review plugins that you can use to capture testimonials easily. These tools support best practices in helping you follow up and ask for reviews. But take care. If you install a plugin and then email 400 customers in your database to ask for reviews all at once, the results may look fake even if they are genuine. It’s smarter to spread out the reviews over time. Google has developed a simple social blogging platform for people, places, and brands with Google Posts. With this system, you can claim your business location and begin posting content that shows up directly in local search results. Make this content engaging with videos, pictures, GIFs, and more. You can even add links directly to your site to drive more traffic. This is like having an extra, free website that can help with your overall ranking. It’s a fairly new feature, so being an early adopter could put you ahead of the game. Don’t let Google steal all your attention. Create or update your listing on Yelp, Bing Local, Yahoo Local Listing, and other directories. The BBB and your local Chamber of Commerce can also be excellent places to list your business to gain credibility with search engines. Make sure your NAP (name, address, phone #) is consistent across all these platforms for best results. And don’t forget to check and manage your reviews on these search directories as well. Google looks for your listings or “citations” all across the web in these directories. The more consistent listings they find, the more confident they are that you own a real business serving your local area. Besides adding listings to directories, your website should also include information that can be accessed and displayed by search engines. The easiest way to do this is through schema markup. These scripts are implemented “behind the scenes” as a way to show important information such as location, hours, accepted payment types, and review pages directly to search engines. The code is not visible to website visitors, but can make a big difference in getting your site found online. Another benefit of a CDN is that it uses the servers geographically closest to the user to deliver content, cutting down load times even more. WP Fastest Cache and other plugins can also speed up load times by creating a static HTML file that can serve multiple users simultaneously instead of having the page render over and over. 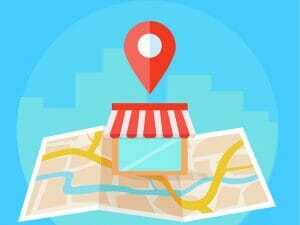 If you have a brick and mortar location, this is a quick and easy way to not only let Google know you have a local presence, but also keep visitors on your site when they click through to learn more. They won’t have to back out to the search page to get directions to your location from their phone. Here are quick directions for embedding a Google map on your site. “Social signals” are becoming an important part of search algorithms. Local businesses that customers mention, share, like, and comment about on social media sites like Facebook attract more attention from Google. Be sure your business page on Facebook is up to date and make a point of engaging your followers with high quality content on a regular basis. Local check-ins add even more authority since they demonstrate that customers are visiting your business in real time. When a customer is looking for a place to purchase goods or services nearby, chances are very high that they are using a smartphone to do it. That means you need a website that adjusts to fit the screen size of all the most common mobile devices. Keep in mind that people looking to visit a place right away may not need all the details that are included in the desktop version of your site. When you are migrating to a responsive theme, consider what actions mobile users are most likely to take and make those functions easily accessible. For example, a customer looking for a hair salon will want easy access to the scheduling app. One looking for a cell phone repair company might want a simple search function to find out if you can fix their make and model of phone. The more highly ranked your main website is, the more relevant and optimized your content can be, and the more visitors you attract, the higher your Google Maps listing can rise. At the end of the day, using best practices to increase the authority of your site will always be good for your local business.